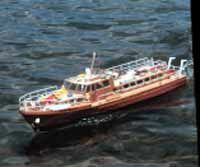 just for the interested some pictures of model ships I have built over the last years. For some of these models a detailed description of the construction is available as pdf (in german). This was the second model I ever built. It was built from a kit made by Graupner that was given to me from my model building assosciation Breisgauer Klabautermaenner. 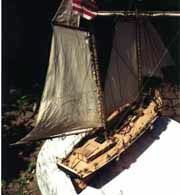 This is the model of an american topsail schooner used in custom operations that was built in 1812. If you study the pictures below closely the sharp lines of the hull and the exzessive amount of sail area are clearly visible. Speed was one important aspect for ships used in border control because at that time without radios or other modern communication equipment Alert had to outrace other ships to catch them. A light gun is installed for defence and as a deterrent. The kit is sold by Krick Modellbau. A scale of 1:25 is used. All the relevant materials and fittings are included; a very good manual explains the building process. The hull is build using the classic planking on frames method. 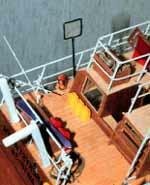 A double planking makes it easy to build a satisfyctory hull – even for novices like me. The complete rig and the fittings are built out of wood. A detailed project description is available in german as pdf. 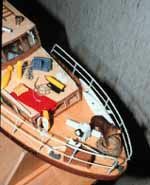 This article was published in the german model building magazine Der Schiffspropeller. Once upon a time…. or to make long things short… at an exhibition I got the hull of a torpedo boat as a present. 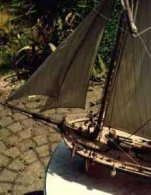 Not willing to build a naval bessel about 20cm of the stern were removed leading to a less extreme length to width ratio. From there on what you can see is my own design. The design of the Wooden Eagle is based on the yachts built during the 1920s (and on my intuition, of course). The use of exotic woods, a superstrucutre with sharp angles and a non streamlined design are features common at that time.